The Voice eliminated Christiana Danielle and Jackie Verna, which determined the fourteenth season's Top 8 artists during Tuesday night's live results broadcast on NBC. Christiana, a 22-year-old from Fort Wayne, IN, and Jackie, a 23-year-old from West Chester, PA, were ousted from the The Voice instead of Rayshun Lamarr, a 33-year-old from Fort Washington, MD, who was the other artist in the bottom three based on home viewer votes cast following Monday night's Top 10 performance show. Christiana -- who fell into the bottom two last week as well -- represented coach Alicia Keys' team on The Voice, while Jackie was on coach Adam Levine's team. Rayshun also represents Adam's team and will continue to work with him going forward. 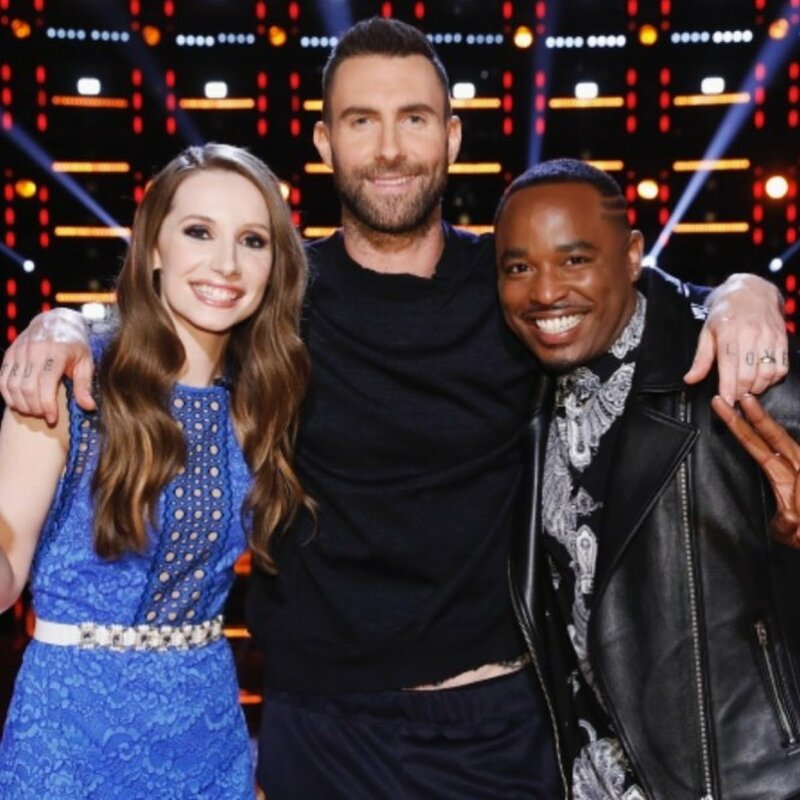 After all three artists sang a survival song last night, America tweeted via the show's "Instant Save" format to keep Rayshun in the competition. This marked the second time Rayshun has been saved in the Season 14 competition. On Tuesday night, Christiana kicked off the elimination format by singing "Unchain My Heart." Alicia called Christiana "incredibly powerful" and said this journey has showed how special she is. Alicia noted she's "a magnificent and magnetic person." "See this vision," Alicia told the audience. "She has so much more to give." Jackie V. then performed "I Told You So," and Adam admitted he was "pretty shocked" to see Jackie in the bottom three. But instead of begging America to save her, Adam pointed out that he didn't need to validate Jackie's talent or attempt to prove she deserves to be on the show until the end. Adam simply said he knows his craft and Jackie is extremely talented and gifted regardless of what happens on The Voice. And then Rayshun belted out an energetic performance of "Let's Get It On." "Do you want to be deprived of this?!" Adam asked the screaming audience. "No! Is it a shame he's even in the bottom to begin with? Then do something about it." Home viewers then had a brief five-minute window to vote in real time for Christiana, Rayshun or Jackie to stay on The Voice via Twitter. By the end of the commercial break, Rayshun was in the lead with 44 percent of the votes pouring in. Behind him was Jackie with 35 percent and then Christiana with 21 percent. Prior to learning the results, Christiana revealed Alicia had inspired her to go out and be strong and rooted and fight for everything she believes in. And Jackie thanked Adam for carrying her through the competition and believing in her. Jackie said she now has the confidence to be the type of artist she wants to be without feeling pressure to please others. Rayshun also thanked God for putting Adam into his life, and then The Voice host Carson Daly announced Rayshun had been saved. Exclusive: Jenna Bowman talks 'Survivor: Ghost Island' -- It was so frustrating, I was never able to make a move!